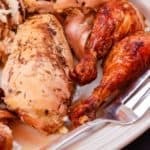 Rosemary Balsamic Roast Chicken is an easy chicken recipe that adds plenty of flavor to your basic roasted chicken for a simple but special Sunday dinner. 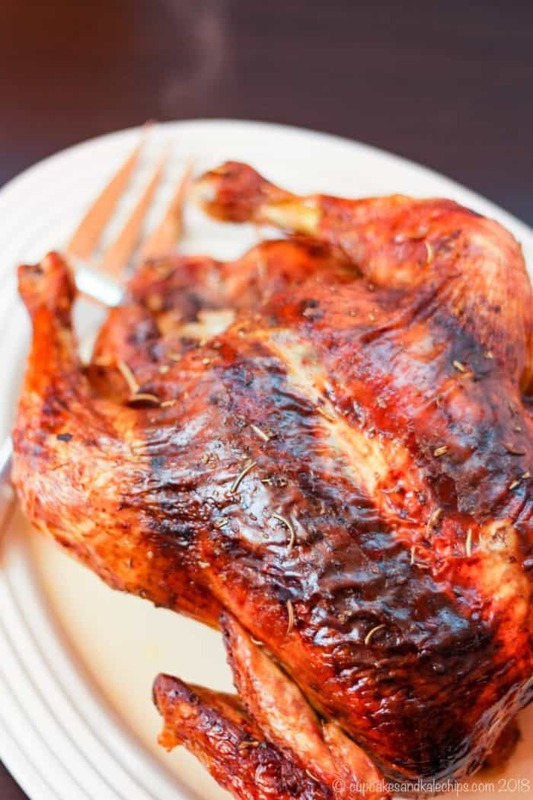 Everyone should know how to roast chicken, and balsamic roast chicken will become a new family favorite version of a favorite comfort food that is also naturally gluten-free, low carb, and paleo. I can’t speak for anyone else, but there’s something about roast chicken that makes it a celebration meal to me. I know it doesn’t take a ton of time or effort, but it’s not something that I often have time to make on a busy weeknight. 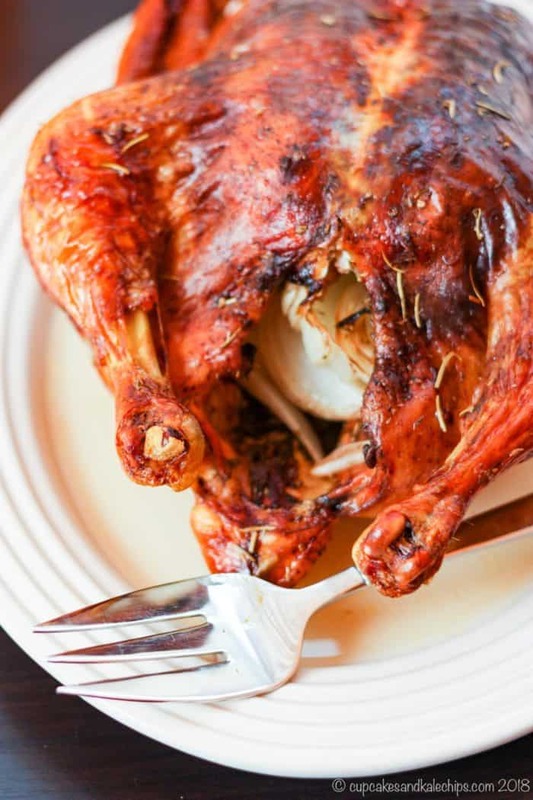 And in the craziness of life, I am more likely to just make it in my crockpot, like this Lemon Herb Slow Cooker Roast Chicken, or just grab a rotisserie chicken when I am at Costco. So I made this to celebrate when The Hubby started a new job. Yes, this is one of my older recipes. In fact, it’s so old I’m guessing that most of you haven’t ever seen it. It’s from back when about three people read my blog. So I thought I would bring it back out. The crazy thing is that these are the original pictures, and they aren’t half bad. I just re-edited to brighten up the colors a bit, since I really had no clue how to do any of that back in 2012, and it looked like a chicken hiding in the shadows. Anyway, I remember being super excited for him! He had been looking for a new opportunity for a while, and he really deserved the promotion. The crazy thing is that since then he left that company completely and we moved from New Jersey to Maryland for a totally different job. And to be honest, I think while the kids were still spending a few days at my mom’s, he and I celebrated with a grocery store rotisserie chicken. 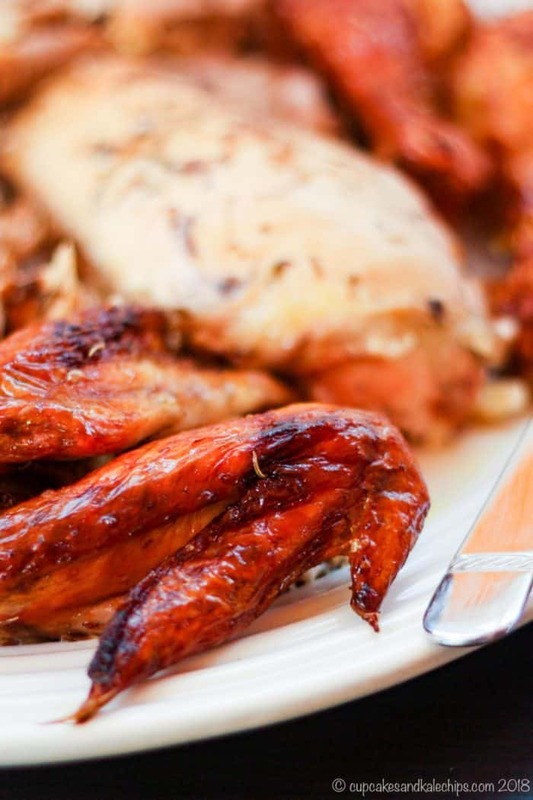 The next time you want a roasted chicken, try making Rosemary Balsamic Roast Chicken. My family does not really have gravy-lovers, so when I am making a chicken, I like to do as much as I can to infuse flavor and moisture. This time is was all about one of my favorite ingredients – balsamic vinegar. 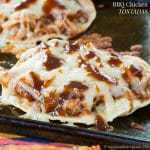 The strong flavor infused into the chicken, and provide a slightly sweet and tangy glaze. 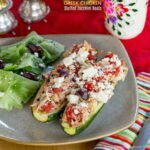 Everyone loves roast chicken, but as an added bonus, this happens to be gluten-free, low carb, paleo, and Whole 30 compliant! It’s so simple to make this Rosemary Balsamic Chicken recipe. Just set your chicken on a rack, place a quartered onion inside the cavity, then pour a mixture of balsamic vinegar, olive oil, rosemary, oregano, salt, and pepper under the skin, inside the cavity, and over the top. Now all you have to do is distract yourself for a couple hour while amazing aromas are coming out of your oven. You could make Parmesan Balsamic Caramelized Onion Mashed Potatoes or Whipped Cauliflower Gratin to go with your roasted chicken. In fact, I’m going to give you a suggestion. 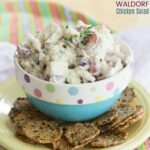 This chicken recipe is so easy, you should make two! Grab a couple chickens when they are on sale, and roast both of them. Why? 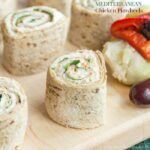 Well, it only add an extra couple minutes to your prep time, and then you can turn it into all kinds of lunches and dinners to have for the week. Perfect for meal prep! We also love French Spaghetti from Wine and Glue. Easy Chicken and Rice Soup from Two Peas and Their Pod is comfort food that comes together in no time when you use leftover chicken. Or enjoy a simple Baby Arugula Chopped Salad from Kalyn’s Kitchen. You guys, I love this roasting pan. It’s perfect for making this Rosemary Balsamic Roast Chicken! Remove the giblets from the chicken, pat dry with paper towels, and place on a rack in a roasting pan. Cut the onion into about 4 chunks and place inside the cavity of the chicken. Combine the balsamic vinegar, olive oil, rosemary, oregano, salt, and pepper. Use your fingers to separate the skin from the breast and pour some of the vinegar mixture under the skin. Pour the remaining mixture inside the cavity and rub some over the outside of the skin. Put the chicken in the oven for 30 minutes. 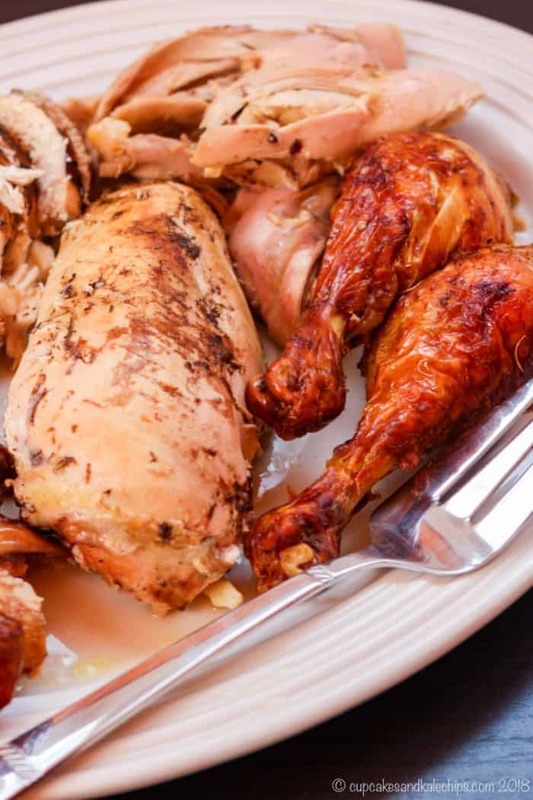 Reduce oven to 350°F, and roast for an additional 1 to 2 hours, depending on the size of your chicken, or until the breast meat registers 165°F and the thighs register 180°F on an instant-read thermometer. 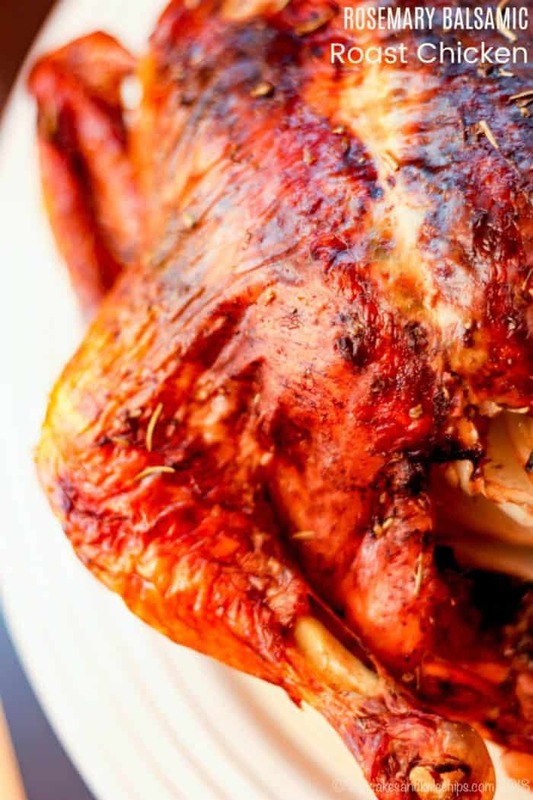 If the skin is browning to quickly, cover lightly with a tent of aluminum foil. Let rest for about 10 minutes before carving. If desired, drizzle with the aged or reduced balsamic vinegar for serving. That chicken looks amazing! Nothing better for an easy meal. Thanks for the shout-out for my arugula salad too. I’d love that for dinner with your chicken! Thank you! I always a love a good arugula salad!